Bring broth and water to simmer in large pot over medium heat. Add ginger through red pepper. Cover; simmer about 30 minutes. Meanwhile, in a large non-stick pan, saute onions, mushrooms and garlic greens in 1 tbsp oil over medium high heat until mushrooms are tender (about 5-10 minutes). Set aside. Prepare udon noodles according to package instructions. Set aside. Using tongs, remove kombu; discard kombu. Strain broth through fine-mesh strainer into another large pot; discard solids (except for ginger pieces) in strainer. Chop ginger pieces and add back to pot. Add chopped carrots, onion/mushroom mixture, and cabbage to the broth. Bring to a boil, reduce heat and simmer until carrots and cabbage are crisp tender, about 4-5 minutes. Add cilantro, tofu, tamari, and rice vinegar to broth and stir. Season with salt and pepper. Using tongs, divide noodles among bowls. Ladle broth over and serve. Lemongrass, an herb that resembles a green onion, has a mild lemony flavor. Kombu (a.k.a. kelp) is a variety of seaweed that’s often used for making stock. It’s usually sold dried. Tamari is a dark sauce made from soybeans. 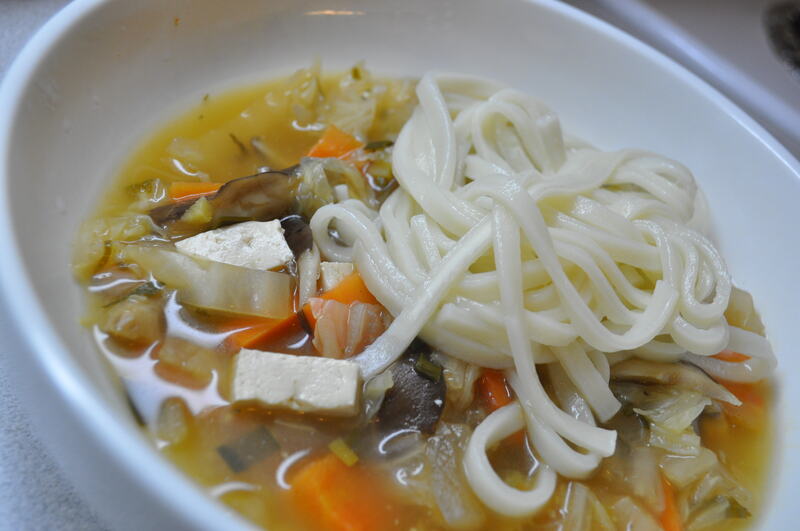 Udon is a thick wheat-or corn-based Japanese noodle.